Our dogs are our babies. They have always slept on our bed and used to be allowed on the couch, until our room makeover. We spoil them rotten and aren’t ashamed to admit it. 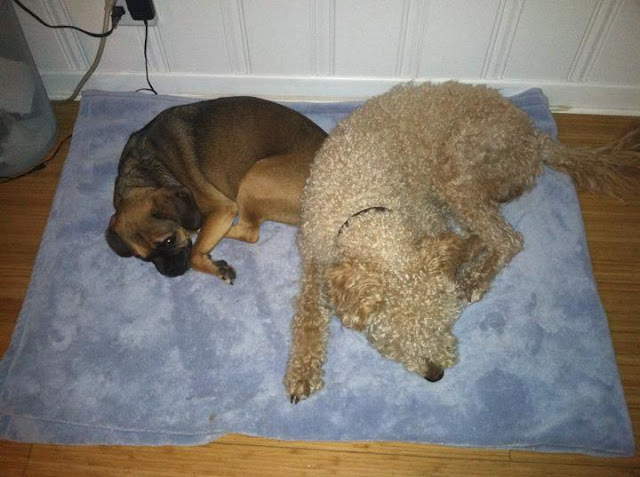 Ruby is a puggle, which is part pug and part beagle, and Jackson is a labradoodle, which is part lab and part poodle. We didn’t intend to own only fancy hybrid dogs, but that’s what happened. It’s embarrassing when people ask what they are when we meet at the dog park or on a walk. We’ve known since we starting TTC that we would have to make some changes with how we treat the dogs before adding a baby to the mix. It took us over a year, but when we got back from our trip up to San Francisco last month, we finally kicked them off the bed. Here they are on night number two of no-dogs-on-the-bed. They took some time getting used to it, but now they’re doing great! I have to admit, sometimes they jump up on the bed uninvited and sometimes I let them stay up there when I’m taking a nap alone, but for the most part, we’ve broken them of their, I mean, OUR bad habit. 1. Ignore the dogs in the months leading up to delivery. I’m not talking about neglect here, but it is important to pay less and less attention to the dogs as it gets closer to baby time. This is most important for the mom, as she will be the primary caregiver for the baby, at least at first. This way, the dogs don’t blame the baby for the lack of attention they’re receiving because it started before the baby got there. 2. Get a crying baby doll and hold it while it makes noise. This will help get the dogs used to the sound of a crying baby and used to you having something cradled in your arms. Keep the baby in a safe place and never let the dogs play with it. 3. Arrange for someone to take care of the dogs during labor, delivery, and recovery. You can have someone on stand-by to pick up the dogs for a few days or have someone come by your house to feed, walk, and play with the dogs when you’re gone. Be sure to prepare instructions ahead of time so you’re not worrying about relaying information over the phone while laboring. 4. Bring baby clothes home from the hospital/birth center/etc. After the baby is born, have someone bring home something that the baby has worn. Let the dogs smell it, but don’t let them play with it. No tug-of-war with the baby’s shirt, ok? Tell them to be gentle as they smell so they know that they are to be on their best behavior. 5. Don’t keep the baby room door closed all the time. If you decide that you never want the dogs in the baby’s room, put up a baby gate to keep them out, but that allows them to see what is going on inside. If you decide to let them go in and out of the room, give them their own spot to lay down and teach them to respect the baby’s things. This can begin before the baby arrives so you don’t have to worry about training the dogs while you have a screaming baby in your arms. Overall, remember that this will be a huge adjustment, not just for you, but for all the members of your family, human or not. Have patience, but be firm as you introduce a new member to the pack. Did I miss anything? What has worked for you when introducing a real baby to your fur babies?